Today we're releasing EasyMorph Server -- a new product in EasyMorph family. Here I'd like to talk more about why we've made it and what to expect in the future. EasyMorph Server is a Windows service with a web console and the same columnar in-memory data transformation engine which is employed by desktop editions of EasyMorph. It runs on schedule projects created in any desktop edition (including the free edition, yay!). Project parameters can be assigned (overridden) in Server tasks. 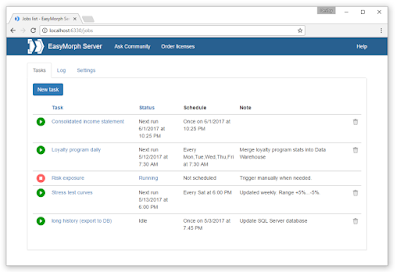 Project logs can be viewed right in the web console and are updated in real-time. Task list (click to zoom). The Server engine performs slightly better than the engine of desktop editions. It runs 10-20% faster and utilizes 10-30% less memory due to server-specific optimizations. For instance, unlike the desktop editions, Server doesn't store some intermediate results since there is no need to display them in UI. EasyMorph Server is designed for analytical teams with limited or no IT support. Therefore, it's very easy to install and maintain. 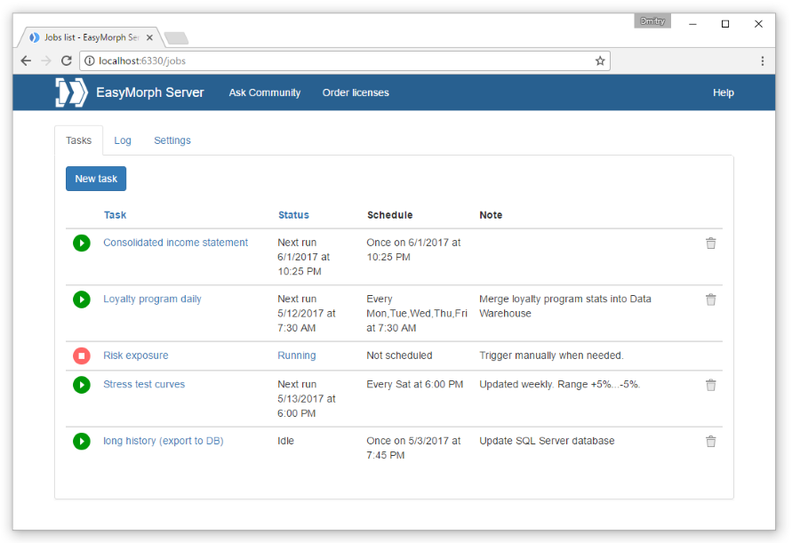 The installer package also includes EasyMorph Server Monitor -- a simple utility to manage the service: start it, stop it, view the server log, and change HTTP port for that rare case when the default one is not available. While the Server doesn't allow creating or editing projects (projects are designed in desktop editions) it still can be helpful for business users that only run projects (created by someone else) because they can view auto-generated documentation on data transformation logic in projects, and understand what happens under the hood when they trigger a data transformation task. For instance, they can see expressions used to calculate columns, filtering conditions, data sources, parameters, etc. 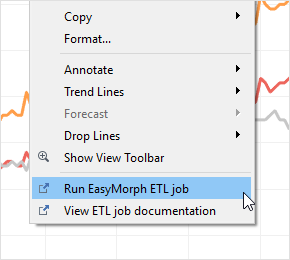 Since the documentation has a permanent URL it can be accessed (opened) from external applications such as Tableau dashboards or Qlik applications. Integration with Tableau dashboard through Actions. Right from the beginning EasyMorph Server is built around a public RESTful API that can be used by external applications in order to create, modify and trigger Server tasks programmatically. The API enables tight integration with 3rd party tools. The Server's UI is customizable. You can change colors and styles, use your own logo and modify links in the web console's header to match your corporate style. Even more than that -- if you're developing and selling an analytical application you can use EasyMorph Server as native component of your application under an OEM license. Note that desktop EasyMorph (required for creating/editing projects) is not customizable. Soon, we will be introducing events -- a means to arrange task cascading and non-schedule triggers (e.g. running a task when a file appears/changes). Private groups will allow restricting access to particular tasks. Email integration will appear in one of the future releases and will make automated receiving and processing email attachments possible. Impact tracking will allow logging and analyzing what project created, consumed or modified what file or database table. EasyMorph Server is licensed per server with no limit on users which means that any number of users can access the Server, create and run tasks, and view documentation on them. Together with the ability to run projects created in the free desktop edition this makes EasyMorph Server one of the most affordable department-level ETL systems on the market. More on the licensing on our web-site: http://easymorph.com/server.html.